​ ​For first-time buyers, purchasing a home is no small matter. Negotiating the sales contract, securing a loan from a mortgage company and acquiring casualty insurance for the property present challenges. Perhaps the most ominous and least understood is negotiating and acquiring title insurance, one policy for themselves and one for the lender. For those unfamiliar with title insurance, the title policy appears to be an array of confusing and often contradictory terms and provisions. Grasping the difference between an exception and an exclusion baffles even attorneys. So, where does the coverage lie? 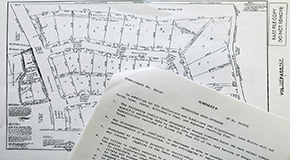 First and foremost, the policy identifies and insures who owns the property according to the public records. This should be the same individuals who appear on the sales contract as the sellers. Second, the policy reveals any impediments that keep the current owner(s) from conveying clear title, such as recorded mortgages, mechanic liens on the property or unsatisfied judgments against the sellers. If the policy fails to disclose an impediment of record that affects the value of the property, the title company may be liable. Third, while the policy should reveal any restrictions on the use of the property, it does not guarantee that the restrictions have been or are being violated. The same goes for possible encroachments on to or off of the property. To gain coverage for these matters, specific endorsements or amendments must be purchased. A residential title policy covers only residential property which is defined as a tract of land five acres or less with improvements designed primarily for occupancy of one to four families situated in a platted subdivision. It also includes property consisting of more than five, but not more than 200 acres, with improvements designed primarily for occupancy of one to four families used by the buyers for agricultural production. To gain strategic and economic advantages from a title company, buyers should request three items from the sellers in the sales contract. The possibility of getting each depends on whether it is a buyers' or sellers' market. First, ask the sellers to provide a residential owner's title policy from a title company selected by the buyers. Here is the reason why. Lenders require buyers to purchase a lender's title policy for the mortgagee as a condition for granting the loan. The cost depends on the amount of the loan. Texas Department of Insurance (TDI) sets the nonnegotiable rates. Assume the purchase price for a home is $200,000. The buyers put 20 percent down leaving a loan balance of $160,000. The premium for the lender's policy based on the loan value would be $1,207.40. The buyers receive no protection under this policy. Buyers have the option, but not a requirement, to purchase an owner's title policy for their personal benefit. Here, the cost of the policy depends on the purchase price. The premium for a $200,000 owner's policy is $1,429. Combined, the two policies cost $2,635.40. However, under what is known as a simultaneous issue, the buyers could get both for an out-of-pocket cost of just $100 if the sellers comly with the request. Here's how it works. If the owner's title policy is purchased first, the title company will simultaneously issue a lender's title policy for $100 as long as the amount of the loan does not exceed the sales price. So, if the sellers provide an owner's policy for the buyers, the buyers can then simultaneously purchase the lender's policy for $100. This cost, however, does not include any endorsements added to the policy by the lender. The endorsements could run as high as $150. Even if the sellers do not provide the owner's policy, the buyers may purchase the owner's policy first for $1,429 and then get the lender's policy issued simultaneously for $100. This represents a savings of over $1,100 as opposed to purchasing the two policies separately. Next, ask the sellers to provide a survey that satisfies the requirements for amending the title policy to read "shortage in area" only (This is found in paragraph 6.C. of the sales contract and is sometimes call the "survey exception"). By doing so, the title policy insures against discrepancies, conflicts, encroachments or overlapping improvements other than those shown on the survey. It will not insure against any shortage in area, though. Without the amendment, the policy provides no coverage for these items unless a specific endorsement is purchased. 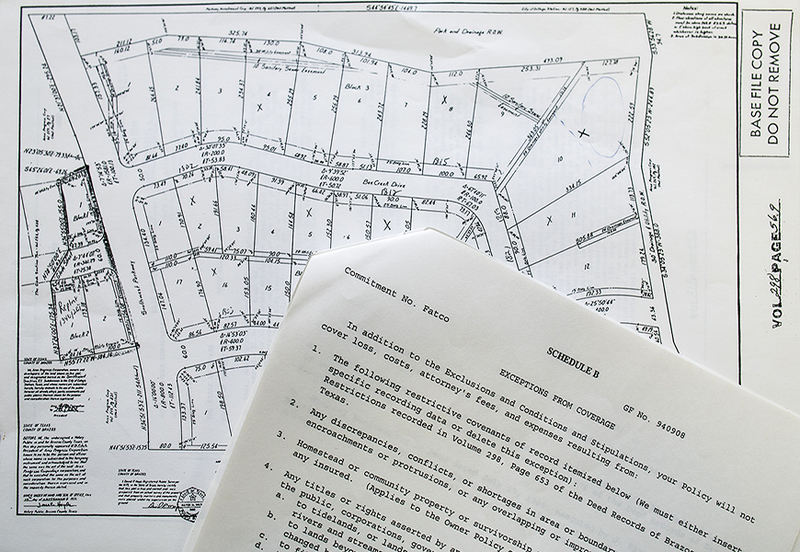 To get this amendment, the title company may require a survey showing the (1) size and location of all improvements, including any protrusions on to and intrusions from adjoining properties and (2) location of all easements, roadways, fences and utility lines affecting the property that can be platted. This survey need not be current as long as the seller signs an affidavit stating that no improvements have been added since the last qualifying survey. If improvements have been added, a new survey must be ordered. Finally, ask the seller to fund the expense for obtaining the survey exception as specified in paragraph 6.A. (8) of the sales contract. The amendment can be purchased only after providing the qualifying survey. Currently, the cost of the amendment when purchased by a person and not a business entity is 5 percent of the base premium for the owner's policy or about $72 for a $200,000 owner's policy. Hopefully, the sellers will comply with these requests. Otherwise, these items can and possibly should be purchased by the buyers. After both parties sign the sales contract, it will be delivered to the selected title company. In about 20 days, the title company issues what is known as the title commitment. The commitment is an agreement from the title company to issue a title policy based on the terms and conditions expressed in the document. The only way to change the title policy is to change the commitment. The changes or amendments are possible only between the time the commitment is issued and closing. Buyers must act quickly or miss this limited opportunity. Experienced buyers know the key provisions and how to make changes. Sometimes the changes are free for the asking, but most of the time they come in the form of an amendment or an endorsement for an extra charge. The endorsements are standardized and promulgated by the TDI for a set fee discussed later. The title commitment is divided into four sections or schedules: A, B, C and D. Practitioners nicknamed them appropriately: About the Deal, Buyer Beware, Clear (or Cure) for Closing and Disclosures from Company. Changes possibly can be made to schedules B and C. The two deserve buyers' scrutiny. Schedule A (About the Deal) describes the key elements of the transaction. These include the effective date of the commitment, the amount of the policy (for the owner's policy, this would be the sales price), type of policy being issued (owner's or lender's), name(s) of current owner(s) of record, type of estate being conveyed (generally fee title), and the legal description of the property. Buyers should make sure the name(s) of current owners and the legal description on the commitment corresponds with those on the sales contract and loan documents. Schedule B (Buyers Beware) lists the things not insured, better known as exceptions. Two types of exceptions appear: standard and special. The first nine listed items are standard exceptions and appear on every commitment. All items listed thereafter are special exceptions and directly affect the property being conveyed. Some of the exceptions can be removed. Otherwise they reappear in Schedule B of the title policy. One of the standard exceptions (item 2) states that the policy does not insure against any discrepancies, conflicts, or shortages in area or boundary lines, or any encroachments or protrusions, or any overlapping of improvements. All the items except shortage in area may be eliminated (or deleted) by getting the survey exception discussed earlier. Schedule C (Cure for Closing) lists the requirements that must be satisfied as a condition for closing. These include such things as showing proof that property taxes, standby fees and assessments have been paid; the property is not being adversely possessed (no third party in possession); and existing liens that need to be paid and released. The title company generally satisfies these requirements. However, if they are not cured, the title company places them in Schedule B of the title policy and the buyers are not protected against the noted uncured title defect(s). Buyers should lodge a written objection with the title company according to paragraph 6.D of the sales contract if this occurs. If buyers file an objection to title, the burden rests on the sellers to cure. However, according to the sales contract, the sellers have no obligation to incur any expense in doing so. Some title companies inform buyers of uncured provisions they placed in Schedule B of the policy. There is no mandate to do so. Consequently, buyers should inquire about any uncured provisions when they receive notice of the scheduled closing. If the uncured provisions are not removed, the buyers may wish to withdraw from the transaction. Schedule D (Disclosures) contains information regarding the estimated premium costs and the names of the shareholders, directors and officers of the underwriter and the title company issuing the policy and the names of any party receiving a portion of the premium for furnishing title evidence, examination and/or closing the transaction. Schedules B and C of the commitment do not list all of the uninsured items. The policy contains a section entitled exclusions from coverage that contains even more. Most notable are defects and adverse claims that are not of record, yet known to the buyers and not disclosed to the title company. No changes can be made to these items. The title policy, however, contains a section entitled covered risks that is extremely beneficial to buyers. Basically, it insures title is vested in the person(s) or entities disclosed in schedule A on the day the policy is issued. If buyers suffer a subsequent economic loss or damage from an insured risk, the title company will pay up to the face value of the policy. However, the defect or loss must occur before (not after) the policy is issued. Some of the noteworthy items in this section include protections from forgeries, fraud, undue influence, duress, incompetency, incapacity or impersonation in a past conveyance; improper filing, recording or indexing of any recorded documents; and invalid powers of attorney. The benefits from this coverage cannot be overemphasized. Additional benefits may be gleaned from the policy via endorsements purchased during the commitment period. The TDI promulgates a myriad of endorsements, but few apply to an owner's residential title policy. Here are the ones that do. Although not an endorsement, the policy may be amended to limit the exceptions listed in schedule B, item 2 discussed earlier to shortage in area only. Endorsement T-19.1 insures, with qualifications, against damages (1) for the violation of enforceable covenants including deed restrictions, (2) for the removal of an improvement in violation of a building setback line, (3) for encroachments on to and off of the property or on to an easement and (4) to improvements (excluding crops, landscaping, lawn, shrubbery or trees) resulting from the development of minerals. However, the coverage for mineral development does not apply if caused negligently or by fracturing, explosions, vibrations or resulting from subsidence (sinking or settling of the soil). The title company may remove the mineral coverage from the endorsement and leave the other three and still charge 10 percent of the base premium. However, with the proper survey, the cost is 5 percent of the base premium. In lieu of endorsement T-19.1, buyers may purchase coverage for surface damages stemming from mineral extraction at a cheaper rate with either endorsement T-19.2 or T-19.3. The first applies to residential property encompassing one acre or less and the second to residential property encompassing more than an acre. The coverage differs slightly. T-19.2 covers damage to improvements (except lawns, shrubbery or trees) located on the property on or after the policy is issued. T-19.3 covers damages to permanent buildings located on the property on or after the policy is issued. Neither covers damages from subsidence. Either endorsement costs $50. ​​​​Between 2009 and 2011, title companies were required to issue either of the two endorsements when (1) requested by the buyers, and (2) the title company inserted a general exception to the minerals in Schedule A or B of the commitment and policy. The wording in Schedule A states, in essence, that the company does not insure title to the minerals in and under the property and that may be produced from the property. The language in Schedule B removes coverage from "all leases, grants or reservations of minerals whether or not they appear in the public records." Even though the language differs, the effect is the same: the policy does not cover the ownership of the minerals. After 2011, title companies may, if it meets with their underwriting standards, issue either endorsement when the two conditions mentioned above are met. It is no longer mandatory. Endorsement T-34 may be issued after closing for increased coverage when the property appreciates in value. Otherwise, the maximum coverage for the owner's policy remains the original purchase price. The policy will not be delivered to the buyers at closing but sent approximately 30 days later depending on the title company. To make sure the policy conforms to any changes in the commitment, buyers should review the "final commitment" prior to closing. This document should be available once the buyers receive notice of the scheduled closing. The policy contains five parts: (1) covered risks mentioned earlier; (2) exclusions from coverage which cannot be changed; (3) Schedule A which contains, among other things, the possible exception to mineral coverage; (4) Schedule B, subtitled exceptions from coverage, contains all the items from schedules B and C of the commitment that were not deleted or cured; and (5) conditions that define the key words used in the policy, describes how an insured seeks recovery, and how the title company must respond to a claim. 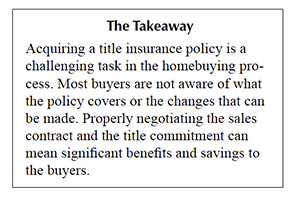 Here are some parting comments for those purchasing title insurance. The policy insures legal access to the property. However, legal access does not mean vehicular access. A mere pathway to the property satisfies the legal requirement. There is no endorsement for residential property that insures vehicular access. The problem becomes more apparent in unplatted subdivisions. When negotiating the sales contract, include an option to change title companies if the initial one will not, or cannot, extend the coverage desired by the buyers. While all the title policies are the same, title companies are not. Ask for copies of all the restrictions affecting the use of the property as shown in schedule B of the title commitment. Make sure no prohibitions appear that may restrict the buyers' desired use of the property. Finally, make sure the legal description shown on the contract and in the policy corresponds with the property actually viewed. The title policy does not guarantee that the property viewed matches the property described and insured. Direct all inquiries regarding title insurance to your local title company or attorney. Fambrough (judon@tamu.edu) is a member of the State Bar of Texas and a lawyer with the Real Estate Center at Texas A&M University.